Last week, the Bureau of Labor Statistics (BLS) published the August monthly “employment report” which showed an increase in employment of 201,000 jobs. It was also the 94th consecutive positive jobs report which is one of the longest in U.S. history. 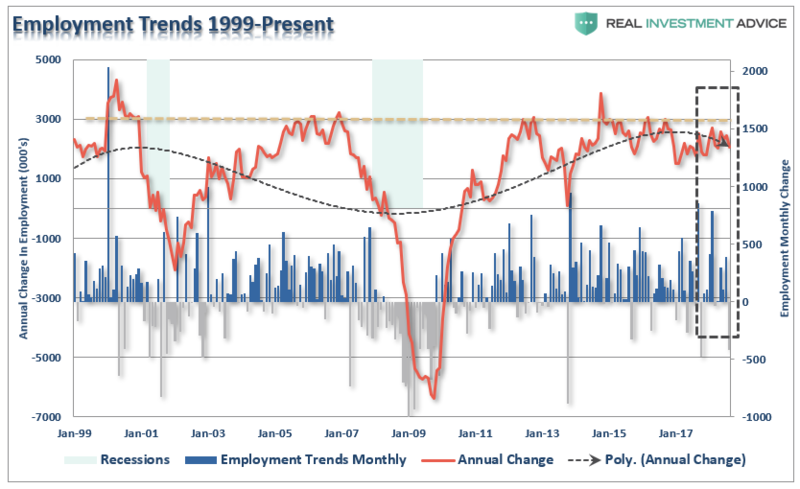 There is little argument, the streak of employment growth is quite phenomenal and comes amid hopes the economy is beginning to shift into high gear. But while there were a reported 201,000 jobs created in the month of August, the two prior months were quietly revised lower by 50,000 jobs. For the 3-months combined, the average rate of job growth between June and August was just 185,333 which stands decently below the 211,000 average rates of job growth over the last five years. Then there is the whole issue of seasonal adjustments which try to account for temporary changes to employment due to seasonal workers. The chart below shows the swings between the non-seasonally adjusted and seasonally adjusted data. 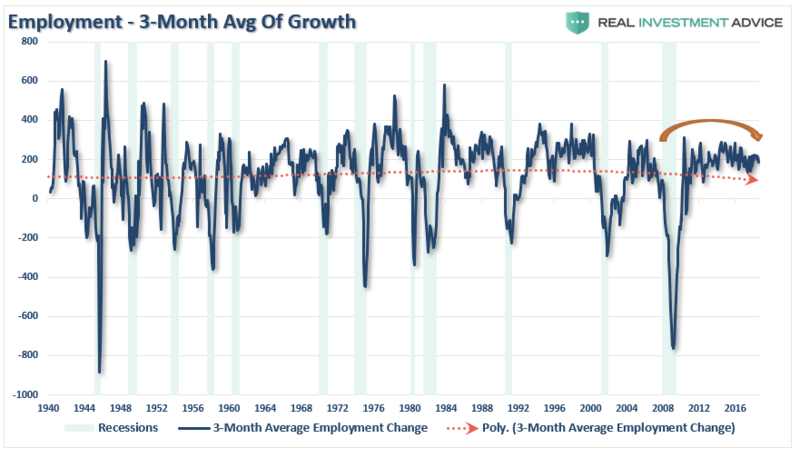 But while most economists focus at employment data from one month to the next for clues as to the strength of the economy, it is actually the “trend” of the data which is far more important to understand. The chart below shows the peak annual rate of change for employment prior to the onset of a recession. The current annual rate of employment growth is 1.6% which is lower than any previous employment level prior to a recession in history. While the recent employment report was slightly above expectations, the annual rate of growth is slowing. The chart above shows two things. 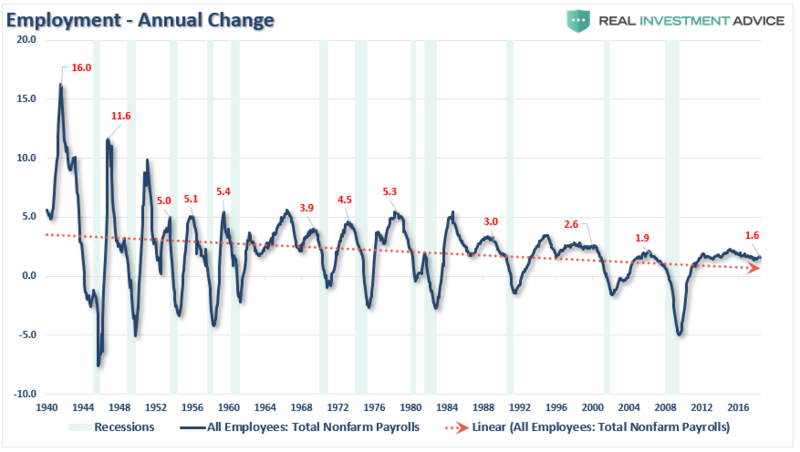 The first is the trend of the household employment survey on an annualized basis. 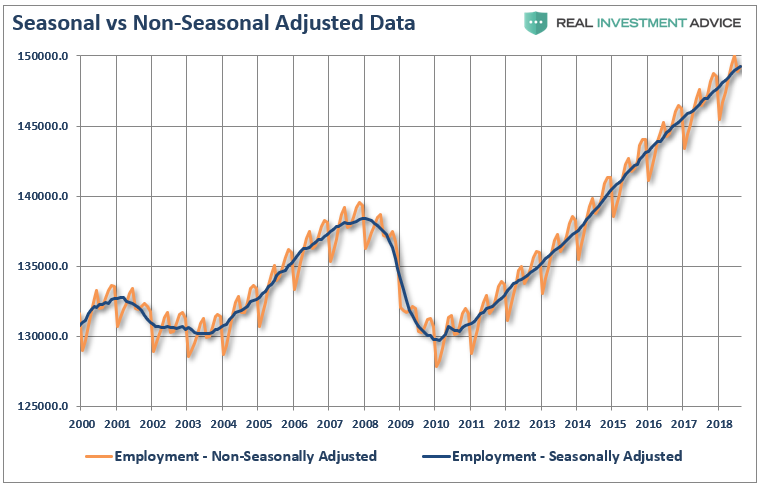 Secondly, while the seasonally-adjusted reported showed 201,000 jobs being created, the actual household survey showed a loss of 423,000 jobs which wiped out all of the job gains in June and July as summer workers returned to school. 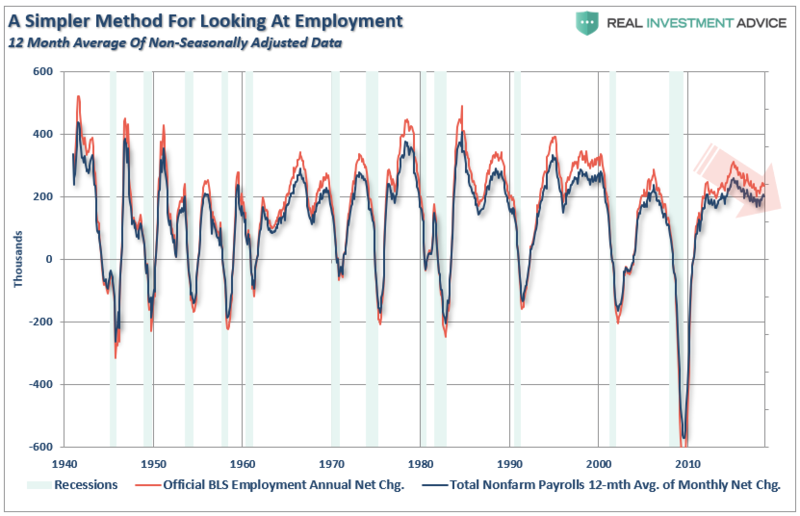 Notice that near peaks of employment cycles the employment data deviates from the 12-month average but tends to reconnect as reality emerges.